This is a professionally built, full custom ’63 Corvette split-window magazine cover car. 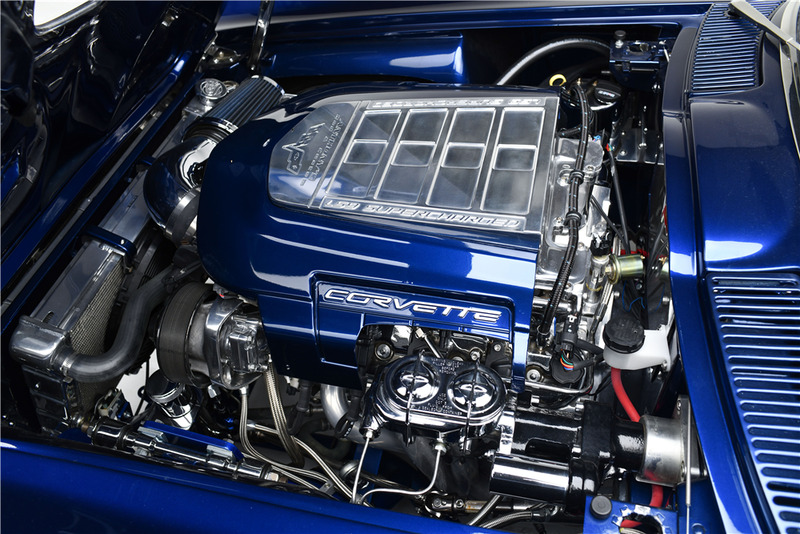 It features an SR3 super tub tube frame, fully polished LS9 6.2-liter engine supercharged to 744hp, and fully polished T56 6-speed manual transmission. It has a Dana 44 rear end, carbon-fiber half-shafts, C5 Corvette suspension and a Painless wiring system. It rides on ZR1 chrome wheels and tires with Brembo carbon-ceramic brakes. It also features an Aeromotive 5000 fuel system and 3” custom exhaust. The custom soft-hide buffalo leather interior features Auto Meter carbon-fiber gauges, Kenwood stereo system and air conditioning by Vintage Air. The no-expense-spared restoration included finishing the car in custom exterior PPG paint.